From the earliest days of the car, more than one hundred years ago, Britain has played a major part in the motor industry. Today, Britain continues to have a vital role in car making and technology in a global market. Using many images from the British Motor Motor Museum’s extensive collections and archive, making British Cars tells the tale of the changing times and fortunes of the motor industry in Britain. 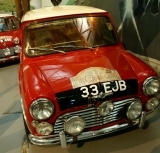 The British Motor Museum describes the progress of technology, growth and mergers, and the highs and sometimes lows of some of Britain’s most well known companies. See how the industry has altered over a century and Britain as been a leader in car production, design and innovation. Yet it is not just a story of factories and machines. It is very personal history, featuring the many thousands of people who have worked in the industry. Brought to life by archive images and moving film, making British Cars charts the ever changing scenes of working life, fashion, well being and social times for those that have been and still are involved in building cars in Britain. Open: daily 10.00am - 5.00pm Closed: 24 December until 1 January inclusive.